I had a brief chat with my Uncle this evening and in explaining some new ventures, this phrase came up. I've never doubted the validity of this statement. I mean my career was jumpstarted by this very fact. I think I've always just needed to work on 1) tapping into my network and 2) being more social in order to increase my network. I oftentimes pass up the opportunity to be out and social and who knows how many doors have been closed from my failure to mingle. 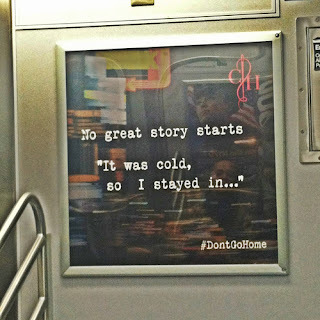 I was inspired recently by the Cole Haan #dontgohome campaign. 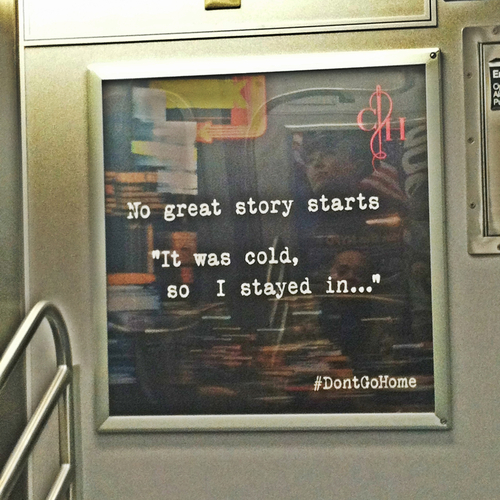 On the trains here in New York, there is a series of ads with sayings like, "No good story ever started, 'It was cold, so I stayed inside...'" And my personal favorite, "You didn't move to NYC to stay home." It made me think. 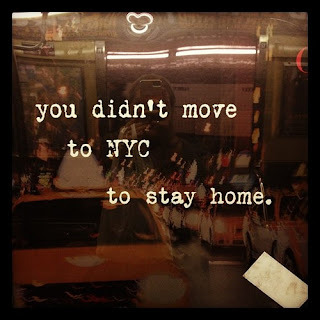 I've always been one to tell people that my New York experience is not permanent, yet here I was forgetting that there's been this imaginary clock ticking away this entire time. It brings to question whether I'm fully utilizing the city for all that it has to offer. I think of how when people come to visit they jam-pack their 3-4 day trips full of activities because they never know if or when they will come back. 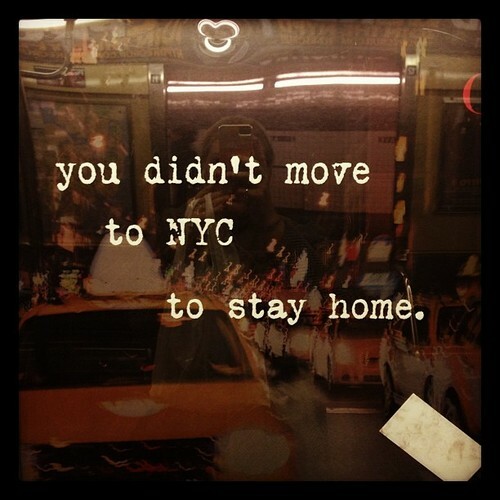 Whereas, here I am taking the fact that I live in this city for granted when just like them my stay is not intended to be permanent. Ive always wondered how people from New York can be anything less than great. This city is full of untapped possibility and an endless flow of resources. My degree of separation from all the people I've ever wanted to meet or work with has literally gone down to 2 degrees, in some cases 1. Yet, I fall victim to this never ending pattern of complacency and speak mediocrity on myself--convincing myself that I'm not where I need to be to close the gap on that 1-2% of separation. As stated in the subject, it's not what you know it who you know and I need to craft a plan to get out of my own way and become the person I set out to be when moving here. Jill Scott's "Golden" randomly began playing while I was writing this. The signs are everywhere. It's my season.